This is a picture of a white ranunculus boutonniere. Ranunculus is a really pretty flower that in my opinion looks like a rose. The reason I chose this picture is because spring recently started and what picture would be better for an Inspiration Monday than flowers. Speaking of spring, it’s even starting to feel like it down here in Georgia! The weather all week is supposed to stay in the 70’s in the evenings and I’ve been able to see some plants starting to sprout once again and more animals are coming out. The dress is white, just like the bulb of the ranunculus. All of the other jewelry and accessories are green like the stem of the rose. I know what you may be thinking, how come you were able to use so much green without it looking like too much? The reason is because the green is more of a duller green so it doesn’t grab too much attention making it look like too much pop. Also the dress is all white, keeping the dress a simple and neutral color allows you to play with more colors in the accessories. As you guys could already tell, I really love Pinterest. It’s just an amazing site, I can look up anything and it shows me so many interesting things. A few of my favorite categories to go and look at are mostly hair/ beauty and humor. Sometimes people post things to wrong category and I end up seeing some cool things that I find interesting even though it has nothing to do with what I’m looking for. Plus with Pinterest I can post anything that I like or I may need for the future on one of my personal boards and I wont lose what I need. One day on Pinterest I was on the humor section and all of a sudden this gorgeous picture of multicolored pebbles under water came up and I was amazed by the beauty of the picture. I found out that the picture was really Pebble Shore Lake in Glacier National Park. I looked up the lake for more pictures on Google and I was not disappointed. The lake was beautiful and the multicolored pebbles were just gorgeous! I think I found a new destination that I would love to visit. I decided to use the picture for my next inspiration Monday because the colors were just amazing and perfect to work with, plus I don’t think I could ever grow tired of looking at that picture. I made sure to use winter clothing for this outfit because since Glacier National Park is in Montana, you can expect it to most likely be chilly. The long sleeve shirt is light blue to represent the sky and the mountain range. Plus I was going to need a soft color in order to use bright jewelry. I put some regular jeans along with the outfit to keep the soft blue. The purse and the jewelry all included the bright colors found in the stones. I thought the watch incorporated the colors from the stones very well, plus it was a really piece of jewelry. The shoes are brown and simple because there was already so many colors in the accessories that adding more colors in the shoes would just look like a bit much. Trends have been known for been done in the past and coming back into style. I can still remember those days when neon came back into style and every kid at my school looked like a walking traffic cone. I have been guilty for wearing a few neon colors myself back when the trends were cool. If you are more into the boho style look, then you are more into the late 60’s style which is more hippie like. Last semester my AP human geography teacher was talking about pop culture and he mentioned Vans and how it’s a reoccurring trend in pop culture. He even told us stories of how he used to skate and wear Vans while his pony tail would be flapping in the wind. I couldn’t help but laugh at the thought. I have been on Pinterest a lot lately and I have been noticing these 50’s skirts coming up everywhere. I have seen these skirts and all I could do was think back to the movie Hairspray and Grease. I have always loved these big skirts because they are so feminine and girly yet very modest. Plus imagine how much fun it would be to spin around in one of these! 50’s skirts are known to have the little poodle at the hem of the skirt, but now a days people have thrown out the poodle and started modernizing the skirt. There has even been a few stars that have been caught wearing the 50’s skirt, such as: Kelly Osborne, Keira Knightley, and even Taylor Swift (which has been known for her vintage style). I don’t think that teenage girls are going to be the main group wearing these skirts because we all seem to love our skinny jeans but I know at least one teenage girl that would love to own one of these. I have been looking at this skirt ever since I was smaller and I saw Sandy dancing with Danny Zuko at prom and her skirt was spinning everywhere. After I started looking at these skirts on Pinterest, all I could do was think back to the days where I would wear a skirt and spin in it just to see if I got the same effect as some of the girl’s on Grease’s skirts. This is definitely a look I am obsessing over and I am really hoping that I will walk into a store and find one of these skirts on the sale racks. For this series I have tried to come up with a lot of unusual ways to use the tribal print. I wanted to create outfits for different occasions because it gives people a better idea of how to style it. I did a more western style outfit using the tribal pattern this time because it would be more of a challenge on my part. I know that the sound of it is really odd, but if you work it right it can look really good. I found this tribal skirt and by itself it didn’t look all that western, but I decided to play with it. I added a white t-shirt because I felt like adding a nice necklaces against the white background would look really good. I later found this necklace that contained the whites and pinks found in the skirt. To me it looked kind of like one of those thick tribal necklaces. I added the earrings because they matched really well with the necklace and the skirt. I added some boots that looked almost like cow girl boots because what is a western look without the boots? I wasn’t going to add a purse until I found this one, it had the colors from the outfit and to me it looked like a saddle. 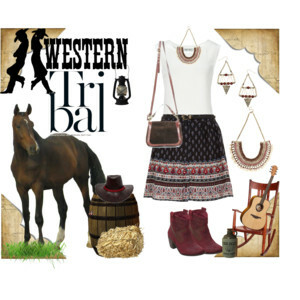 I think that this look is very western and still incorporates the tribal very well. Patterns are something you have to play around with. All patterns can be used in many ways, but they are not always used the are the right way. A lot of people tend to think that tribal patterns are meant for casual clothing, but that’s not the case. 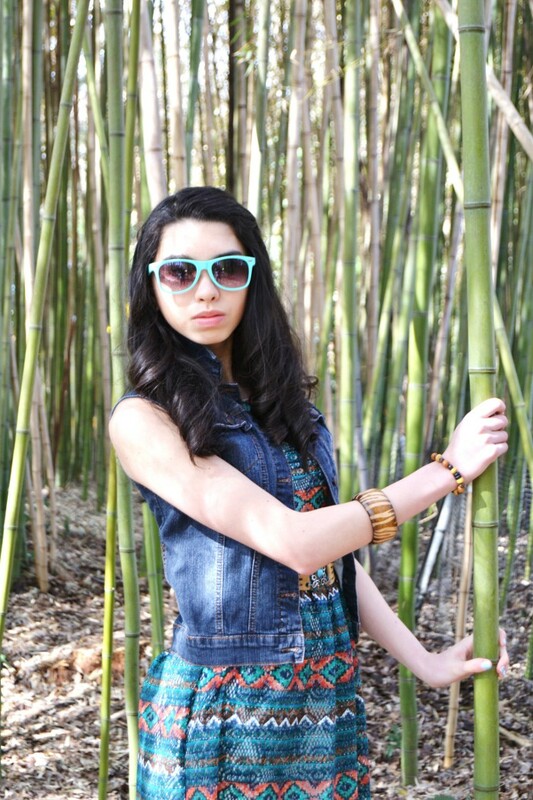 Tribal patterns can be used for more serious or elegant looks, it all depends on how a person uses it. Previously in the series I posted a tribal outfit that was appropriate for those who work in the office. That outfit had a tribal pattern in the skirt yet is still looked sophisticated. The thing about patterns is that they can be used for whatever kind of outfit you want as long as you can style it right. I wanted to demonstrate to you guys how to incorporate the tribal pattern into more elegant outfits, so I created an outfit that would be perfect for a person to wear if they were invited to a wedding. I used a gray and yellow dress with a tribal pattern because I thought it was really pretty and it use the tribal pattern perfectly! I made sure to put a coat because depending on what time of year the wedding is on it could be cold. Plus I found that adding the fur coat also added some extra style to the outfit. The accessories are all yellow and gray to go along with the dress. The shoes are a pale gray as well because since there is already a lot going on in the dress and accessories, adding too much color or pattern to the shoe would look odd. I was recently invited to a party which consists of everyone going to the movies, eating dinner, and having a sleepover. 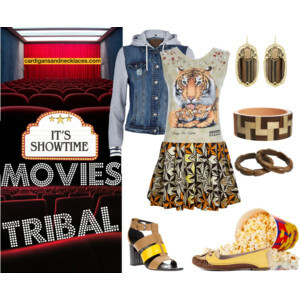 This invitation gave me the idea to do an outfit for the movie theatre but with the twist of adding in the tribal pattern. I always make sure to look good when I go to the movie theatre because I always manage to see someone from my school at the same theatre. It makes sense for me to find a few people from my school because the movies is the perfect hang out for teens. It’s an easy place to meet up with friends, tickets are not too expensive, and it’s always fun to watch a good movie with people. What I love about the movies is that I can wear whatever I want without having to worry about dress code and someone from my school is bound to see it. I love wearing skirts and dresses to the movies because I never wear them to school. I always get afraid that the dress isn’t length appropriate because it’s kind of embarrassing when a teacher has to tell you to go to the front office and change into something more appropriate in front of people. For my outfit I put in a dress with a tribal patterned skirt that has the colors orange, yellow, and white. The top of the dress has a picture of a tiger that has the colors from the skirt. What I like about the dress is that it looks like a skirt and a shirt, plus I like how they used the tigers along with the tribal skirt. I always bring a jacket to the movies because sometimes it can get cold inside the theatre, I don’t handle the cold very well. I added a denim jacket along with the outfit because I think denim jackets are just so cool and stylish. The shoes are yellow and tan to go combine with the colors in the dress. I used wood jewelry because the browns go really well with the colors and because I always think of wood accessories when I see tribal patterned clothing (depending on the colors of course). A movie that I want to see is the movie Divergent. It’s coming out this Friday! I read the books and they were really good, hopefully the movie will be as good. What movie have you been wanting to see? For my sister’s birthday last weekend, the whole family went to the zoo. It was a lot of fun to get to see all the animals, especially since the last zoo I went to was the one in Washington D.C. but we arrived late and none of the animals where out. I swear the only animals we really got to see at the Smithsonian Zoo was the squirrels running around, not very fun. At the zoo in Atlanta, there were all sorts of super amazing animals, even some that I just wanted to stuff into my bag and take home. Like for real, who wouldn’t want a baby Panda? I think my favorite animal to see was the gorillas because there were a lot of them and they were very interactive. You could even see one of the mothers with her baby on her back and the silver back hanging out around all the women. One of the ugliest animals there would have to be the naked mole rat, their teeth are so big and they look like wrinkly hot dogs. The zoo was divided into different continents and the animal were placed inside the continent they would most likely be found in. I really like the Africa section because it had the elephants and the giraffes which were really cool as well to look at. Something I got to experience at the zoo was trying dipping dots for the first time. I got cookie dough flavor and that was so much fun to eat. The texture was really weird yet enjoyable at the same time. Not to mention that the flavors were really good as well. 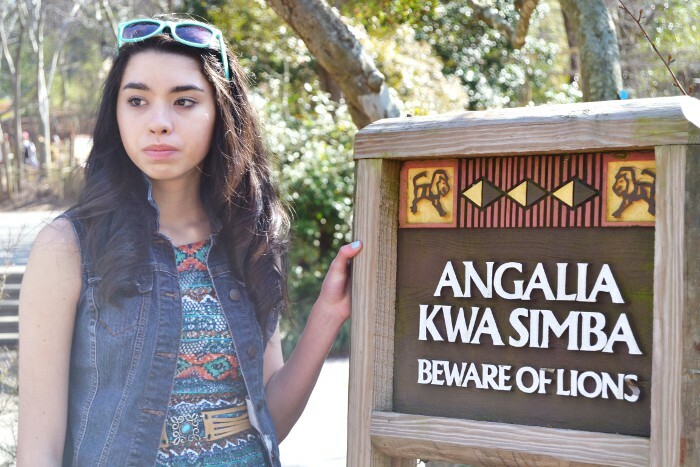 I took my tribal outfit picture in the African section of the zoo because when I think of Africa I think of small tribes. 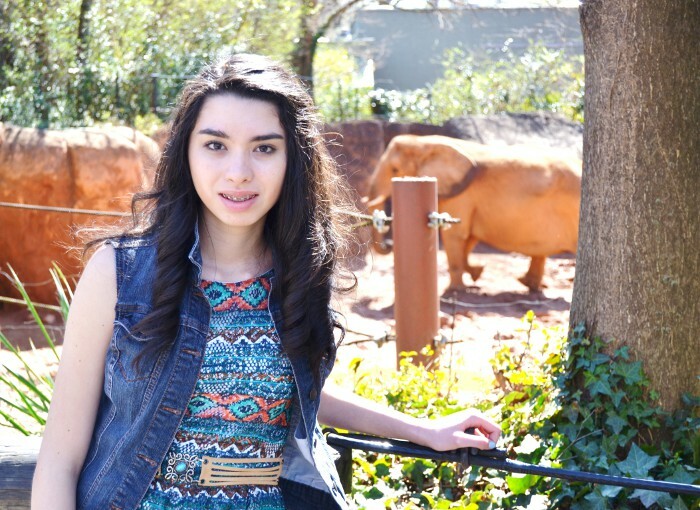 I wore a tribal pattern dress which had a lot of blue, orange, green, and brown. I wore a denim jacket to add some layers other than just the dress. I wore wood studded earrings with a wood bangle and a small wood beaded bracelet which was used to bring out the brown in the dress a bit more. I added a brown and teal blue belt which contrasted really well against the colors of the dress. I wore teal and brown sandals which were also colors found in the dress. I didn’t wear a necklace with this outfit because it would just get lost in the pattern and no one would really be able to see it.